True Vine Ranch ﻿offers the highest quality large blueberry plants for sale. Let our family help you get a fast start successfully growing mature blueberry bushes of your own. You and your family can enjoy the sweet fragrance of their white "wedding bell" blooms, delicious-fresh fruit and vibrant fall foliage. True Vine Ranch, our family farm, is located near Kansas City, Kansas. We have over 20,000 State inspected premium blueberry plants available for shipping in spring and fall to your home. Our desire is to help homeowners all over America grow our large productive blueberry bushes. Why Start Growing Blueberry Bushes from True Vine Ranch? 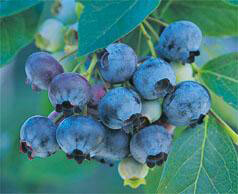 We offer America's #1 planted Northern Highbush blueberry varieties Duke, Bluecrop, and Elliott. We also offer the Liberty, Reka, and Legacy blueberry varieties. Suited to 2012 USDA planting zones 4-8. Use your zip code to check your zone at ﻿USDA Plant Hardiness Zone Map﻿. Require a soil pH of 4.0-5.0. When you buy blueberry bushes from us you will receive our easy to follow instructions for how to plant blueberries which will enable you to get the perfect pH for blueberries at planting time. Our large and mature size blueberry plants typically bear fruit the first growing season. Produce up to nickel sized fruit. Thrive in summer heat of over 100 ºF and winter hardy to minus 30 ºF. Blueberries are nutritious and high in antioxidants. Make home grown blueberries a delicious part of a healthy diet. Let customers who buy blueberry plants from our farm tell you why. Check out our customer reviews on Google at True Vine Ranch reviews. We are currently taking orders for spring planting. We will ship at YOUR convenience any weekend YOU want the plants to arrive from Mid-March through May 2019. We are unable to ship to California, Georgia, Idaho, Nevada, Oregon, Utah, and Washington due to state restrictions. Please contact us with your questions or comments. We enjoy hearing from you. Thank you for your interest in our family farm. We pray you bear much fruit for Jesus and His kingdom as you remain in Him.